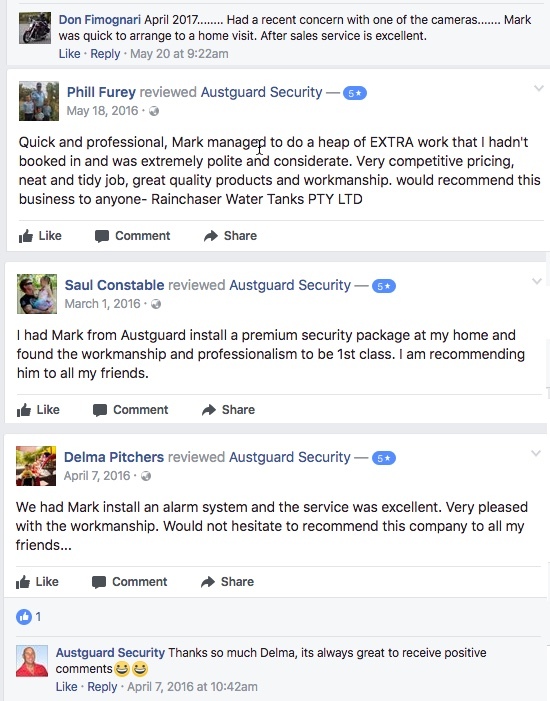 My name is Mark Schwarzer and since 1988, we have been providing quality, cost-effective security solutions for West Australian businesses and homeowners. With our vast experience in all aspects of commercial and residential security and a passion for unsurpassed customer service, we always go the extra mile to ensure our clients get the security solution that best meets their needs. This passion for delivering superior levels of security and commitment to our clients has made us the go-to business and home alarm systems experts in Perth and WA. Whether you’re looking a home alarm system for your Perth home or a security alarm and monitoring system for your place of work, Aust-Guard Security can advise you on the broad range of alarm and security systems we supply. 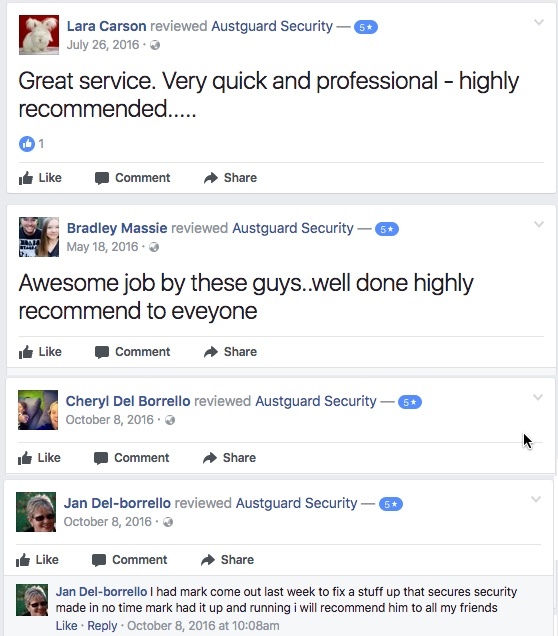 Drawing upon two decades’ experience in advising, supplying and installing security and monitoring systems to home and business owners across Western Australia, you can rely upon Aust-Guard for all your security needs. 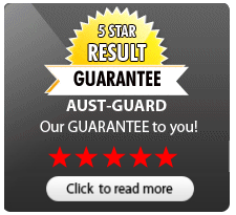 Our service is fast, friendly, reliable and professional, we’re members of the Australian Security Industry Association Limited, and we back up our promises to our customers with our unique Five Star Guarantee. 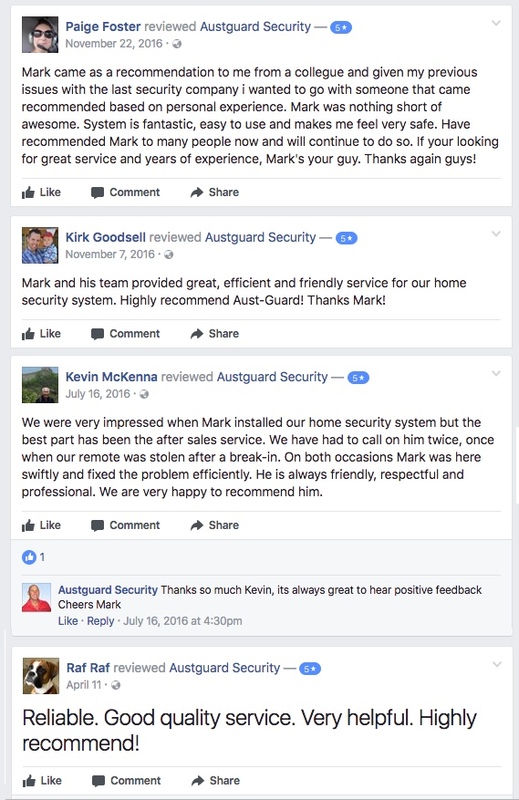 Get in touch with our friendly security experts today to learn more. 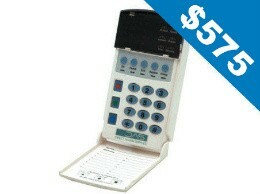 Aust-Guard Security provides first-class alarm installation services to Perth home and business owners. 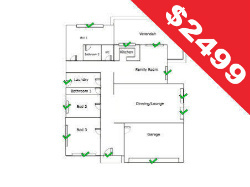 After helping you select the perfect home or business security alarm system for your Perth property, we can install it for you and ensure it’s working correctly so that you can enjoy the peace of mind that comes with securing your property with a suitable security system. In addition to alarm installations, we also upgrade existing systems so your commercial or residential property is kept up-to-date with the latest technological advances in home and business security to ensure you’re always one step ahead of criminals. 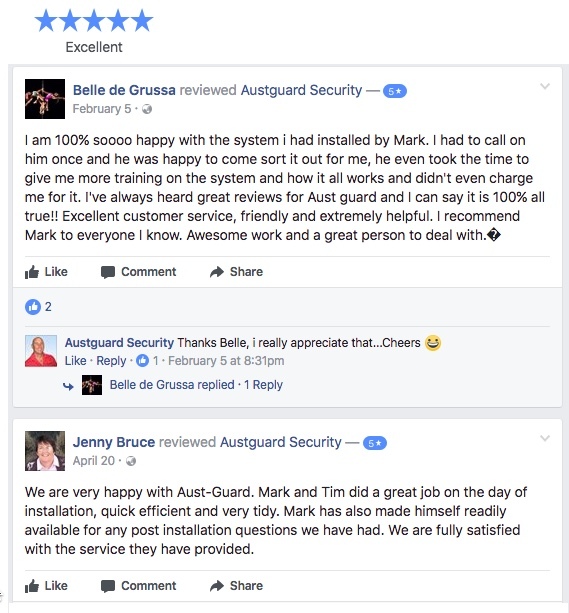 Aust-Guard is also able to provide alarm maintenance services to ensure your system is working correctly at all times and provides you with the protection you and your family or employees deserve. Contact Perth’s alarm systems experts to learn more about our alarm system installation, upgrading and maintenance services. "90 PERTH HOMES ARE BROKEN INTO DAILY"
Wireless systems are highly versatile and enable homeowners to control their home alarm systems remotely. 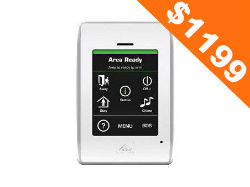 This delivers a wealth of benefits, including flexibility, versatility and enhanced peace of mind, and has made wireless home alarm systems very popular among Perth homeowners. 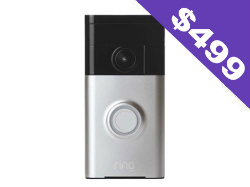 These systems are expandable and can be integrated with other building systems, including access control and monitoring systems, so if you’re looking for the most versatile Perth home alarm systems to secure your residential property, a wireless alarm system is a fantastic choice. Give Aust-Guard Security a call on 1300 883 898 to learn more about the benefits of installing a wireless house alarm system in your Perth home and the wireless systems we currently supply. A CCTV system is a first-rate investment in your home or place of business as these surveillance systems provide you with round-the-clock surveillance that serves as an excellent deterrent to criminals and provides tangible evidence should a break-in take place at home or at work. 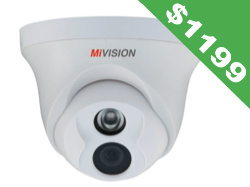 These affordable yet technologically advanced surveillance systems were once only used by businesses, but they’re now a common sight in Perth homes where they’re often combined with alarms and security systems to provide further protection for homeowners and their families. The benefits of having a CCTV surveillance system installed at your home are profuse and include increased deterrent to criminals, increased detection and reduced fear of crime. In addition to these excellent benefits, there are even more outstanding benefits afforded to business owners as they also enjoy a safer work environment, reduced theft (both staff and customer theft, and the opportunity to eliminate fraudulent insurance claims which helps to reduce premiums. As the leading CCTV surveillance and alarm installers in Perth, Aust-Guard Security can help you select the perfect system for your commercial or residential security needs. "THE BURGLARY RATE IN WA IS TWICE THAT OF THE EASTERN STATES"
Aust-Guard supplies and installs a great range of access control systems to suit the needs of all home and business owners. 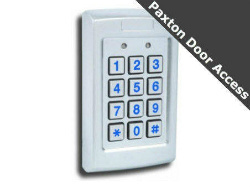 We can combine an access control solution with the alarm systems at your Perth property or supply and install a standalone solution controlled by intuitive, user-friendly software that enables you to grant access to groups and individuals quickly and easily. In addition to delivering benefits such as centralised control of access privileges and the ability to manage hundreds of doors and thousands of users, an access control system installed in your home or place of work is completely scalable so you can combine it with other systems easily, it provides event reporting, and by tracking and recording access, it provides superior levels of security in all commercial and residential environments. Contact Aust-Guard today to speak with one of our security experts about the access control systems we supply and install. Aust-Guard is linked to a 24-hour monitoring station in Malaga to provide clients across Perth with an immediate and effective response to any alarm activation. The state-of-the-art control room at the Spectus monitoring station is manned by highly trained security personnel who are passionate about providing safety, security and peace of mind for our clients. With your high-tech home or business security alarm systems monitored by experienced Perth security personnel you can rest assured that you’re in good hands. Call Aust-Guard Security today to learn more about the reliable security monitoring services we provide. "CASH, JEWELLERY AND LAPTOPS ARE THE MOST STOLEN ITEMS"
Along with the perimeter alarms we supply and install for Perth clients, the guarding services we provide are an excellent means of ensuring your commercial or residential property is completely secure at all times of the day and night. Our security guards are highly trained and experienced and provide commercial and residential clients with a reliable guarding service they can rely upon. Combined with business or house alarm systems, Perth clients will enjoy the highest levels of security and the peace of mind that will naturally ensue. Contact us today to learn more about the many benefits of using our reliable security guard service that’s helped many clients across Perth secure their commercial and residential properties. We also guarantee the quality of our workmanship for the lifetime of the installation. 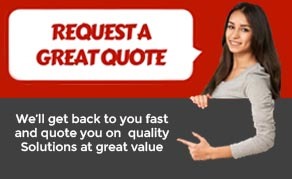 That’s a guarantee no other security company in Perth can offer you. Aust-Guard are leading providers of access control, CCTV monitoring and security systems, as well as security guard services and burglar alarms for Perth clients in the commercial and residential sectors. 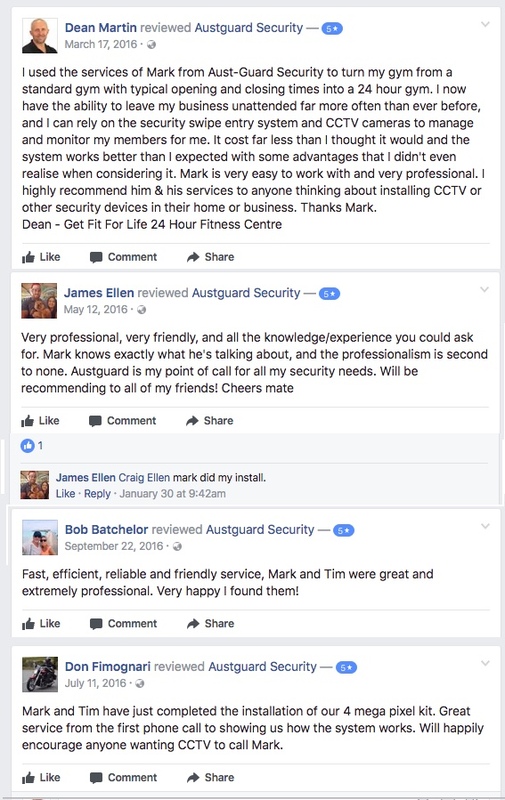 With our experience, genuine passion for helping our clients secure their homes and places of business and enjoy the peace of mind they deserve, we have developed a reputation as the best value and most reliable alarm systems providers in Perth and WA. To learn more about the wide range of security products and services we provide, call us today on 1300 883 898 for an obligation free security consultation at your home or place of business.